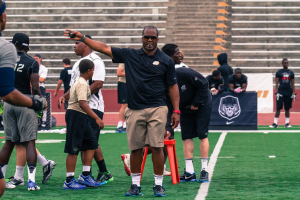 This past summer we had the opportunity to work on an ESPN project with George Whitfield, one of the most respected quarterback coaches in the business. The Elite 11 Finals showcased the next generation of great quarterbacks in a two part series that pitted the nation’s top prep QBs in a grueling week long competition. 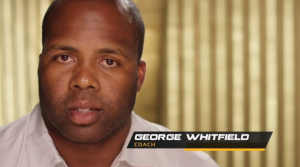 Coach Whitfield was part of Trent Dilfer’s talented staff of coaches that were featured in the program. 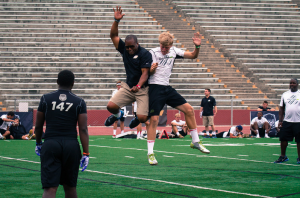 George has worked with Ben Roethlisberger, Cam Newton, Andrew Luck, Donavan McNabb, and recent Heisman winner Johnny Manziel. In fact, on November 26 when then Heisman frontrunner Johnny Football spoke to the media for the first time he credited Whitfield for helping him with “overstriding” issues when he threw the ball over the summer (source). Here’s a link to today’s USA TODAY piece and a couple of pictures of George doing his thing at the Elite 11 camp this past summer.